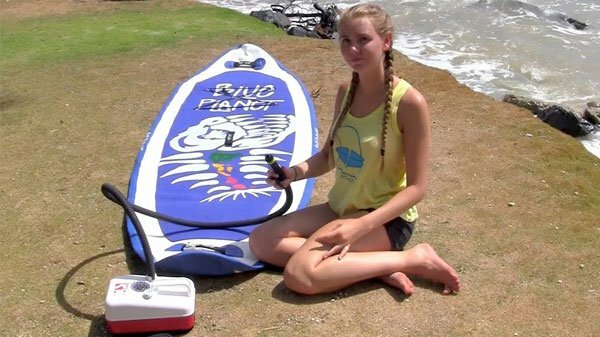 The Bravo 20 electric inflatable Stand Up Paddleboard pump is the best electric pump we have tested so far. We have sold and tested the Italian made pump for over a year now with no issues other than the internal batteries going flat if the pump is not charged for long periods of time. See below for a video on how to replace the internal battery. The Bravo 20 iSUP pump has an overheat shutoff which effectively prevents damage to the pump. The quiet operation, reliable pump operation, and internal, rechargeable battery make this pump a great choice. overheat protection keeps pump from burning up, an issue we had with other iSUP pumps. Internal battery, portable and does not need to be hooked up to car battery. Please keep battery charged when not in use .